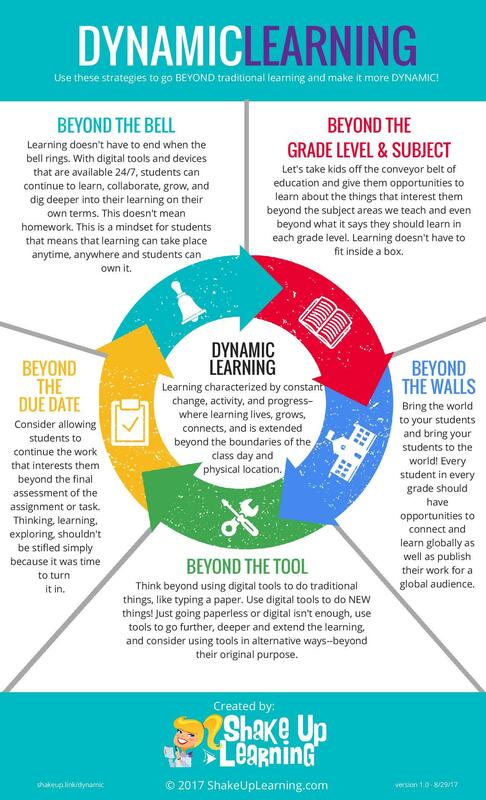 In my quest to make sure the learning doesn’t stop for my student when the school doors close for the summer, this post about Dynamic Learning from Kasey Bell was just the push I needed. Because I use Google Classroom consistently throughout the school year, my students often add to or update things they have made or written after school is out. They sometimes even revisit my comments on their grade as much as a year later, sending me an updated version. This post helped me to think more intentionally about that process. I have obviously moved beyond the bell and beyond the walls, because students I no longer have in class continue to work on and refine projects from the previous year, but I feel that I have not yet gotten beyond the tools. I am looking for ways to extend the tools beyond their obvious purpose, particularly ways that would allow students to produce things for a real audience. That will be my personal challenge as I plan for next yeaR.